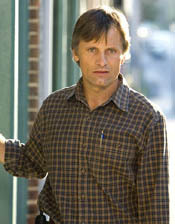 Actor Viggo Mortensen has an eclectic sense of artistry. He is keen on storytelling, not only through his work as a thespian, but also through his efforts in literature and even photography. Maria Bello describes him as being a man whom you cannot separate from his art, and speaking directly with the actor, one detects an unabashed sense of cultural acuity - an attunement with the world of self-expression. Mortensen's first screen role came in the form of Peter Weir's 1985 thriller Witness, a film that, ironically enough, examined in one scene the philosophy of violence and retaliation as a means of protecting oneself against outside forces. Twenty years later, he stars in David Cronenberg's A History of Violence as Tom Stall, a small-town hero under dramatically tense circumstances who defends himself, his diner and his patrons one night against a pair of would be murderers. The method? A virulent burst of pent-up, violent aggression that is every bit as efficient as it is distressing, and the catalyst for both a film and a performance that exist as two of the finest examples of societal dissection this year. Tackling a character with layers such as these, Mortensen found he could relate on specific levels, and in so doing, understand the nature of reflection Josh Olsen's screenplay (based on the graphic novel by John Wagner) bestows upon the viewer. 'I think that we're all multiple personalities,' he reveals. 'I think it's interesting and disturbing, especially seen through Cronenberg's eyes, which are relentlessly looking for what's underneath the layer of civility. I think that people are complicated. It's what's beautiful and also what's scary. Any person can think anything, can imagine anything, good and bad, no matter how sheltered their existence, how young they are. They are capable of beautiful, noble sentiments as much as they are of very dark and troubling thoughts. As a character study, A History of Violence has it in spades on the majority of cinematic product this year. It's both refreshing and appalling, peeling back the bloody layers of humanity and forcing our eyelids apart for analysis of our sickest, deepest, most frightening capabilities. A first glance at a screenplay such as this would not immediately indicate a near-masterpiece lurking between the lines. As Jonathan Dee noted in The New York Times Magazine last Sunday, 'it's a more substantial film, somehow, than it has any right to be.' The tight-rope walk was immediately apparent in the eyes of Mortensen, and though initially skeptical that the script could become a true work of art, he soon found himself sharing in the delight of creation with director David Cronenberg. In fact, the scripting process transformed the story into just that - a tight and taught thriller that squeezed every ounce of characterization out of each and every frame. On the actual violence of the film, the filmmaker and actors took an extreme naturalistic approach to both the physicality and the psychology of the scenes. The result is some of the most impacting cinema in the director's portfolio - which is saying a mouthful. Working with a director the caliber and distinction of David Cronenberg was an experience unequalled in the eyes of the star. Each and every question seems to allow for Mortensen to leak a bit more of his heaping praise and reverence for the filmmaker. His appreciation for Cronenberg's methods of telling the story of A History of Violence with a steady, guided hand is quite apparent. 'In telling this story, there're a lot of moments which last much longer than a normal director would let it last. Like the sequence after Ed Harris - what happens to him and the son and the father - he lets that play, and play, and play and lets us see what happens. Other directors wouldn't have the patience or the courage to say "well, I don't know if the audience will have the patience for this.' But that's him having a good time. It's rhythm. He's like a musician. He knows that he can play a drum solo for quite a while and he knows just when to go into the next part and bring other elements in. As for his own approach to conveying the story as a thespian, Mortensen seems to agree that less is more and that actions speak louder than intentions. 'I don't really think so much about the audience, not because I don't respect them, in fact I think my way of respecting the audience is thinking people are intelligent. If you are honest in the way you tell something, if you're really feeling and thinking real things, it's going to show. And if you don't try to make it a message or be very obvious for the sake of being very clear or something, people will appreciate that. The film sets up a family dynamic that hinges the entire scope of the story. In its Americana, comely, small-town fashion, the aspects of the characters' disintegrating relationships become more eye candy than any special effect. Mortensen's chemistry with co-star Maria Bello - who portrays Tom's wife, Edie - provides the spine for a true familial dissection. Concerning his on-screen cohort, Mortensen's praise is of the highest regard. And speaking of Bello, she had expressed an interest in hopping behind the camera. Does Mortensen have a similar inclination? Mortensen shares a specific physical trait with Mr. Cronenberg that ultimately becomes rather defining - that being a set of penetrating blue eyes that present a serene and composed individual. He's a calculated thinker, full of political and philosophical commentary. But on the issue of reading significance and meaning into A History of Violence, he seems more concerned with taking the film on its own terms. It isn't a film to be sanctioned or categorized. 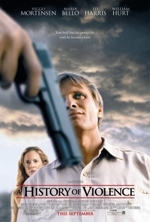 Above all else, in the mind of Viggo Mortensen, A History of Violence should be hailed as the intriguing character analysis that it is, rather than a piece of filmmaking boasting any sort of agenda. 'You can certainly go there, because it's a complex movie. You can find parallels of all kinds. And I've been surprised at some of the things that people see in this movie. I even thought about it myself because you can make a case for it, and America is documented as being pretty much a gun-toting, wild west kind of place compared to a lot of countries, but it's not a particularly American thing - violence, or consequences of violence - and as much as people can go to extremes and say it's about American violence or it's about American foreign policy or any number of things you can say, if you want to, you can make a case for it. That's not the intent, because it's too good a movie. He's too good a director and too smart. You can't limit it that way. You can, but I wouldn't. You can go crazy. There're film critics that always write things that way, and they just go into all of that. And it's valid. You can make a real philosophical study of this movie. But you don't have to have that bent or that appreciation or academic inclination to appreciate the movie. That's what's great about it. It's this super well-crafted, well-tooled machine, this piece of filmmaking. It's as close to perfect, in terms of its functioning. If it was an engine, it just sounds and works perfectly. It's supremely efficient in terms of storytelling, but unlike other movies that approach being as technically well made, it has a big heart - and a messy heart. It's not cold. You can't really pin it down, I don't think. You can try, but there's always going to be something else. Of course, he was referring to Hurricane Rita, which was bearing down on the gulf coast the day of our interview, which led me to bring up his statement calling for action in the wake of George Bush's lax rection to the crisis in New Orleans. All talk of A History of Violence was over at that point, as I happily conversed with the actor about his views on policy, his valiant stance against the current administration, and his noble beliefs in a system that caters to honesty above all else. It was a conversation of intrigue to say the least, and he is passionate in his thoughts and feelings on the subject. But more on that at a later date. Getting back to the issue at hand, Mortensen's performance in A History of Violence is unquestionably his greatest work to date. It's a character cut out and constructed perfectly for the actor, and as previous endeavors go, it was business as usual for a man who considers his pantheon of characters comrades of flesh and blood. All involved in the making of A History of Violence seem to have walked away adequately affected by the experience. Mortensen is no exception. 'I think for me this will always be a milestone, because I think that in this movie, I got to see the best possible way that a movie can be directed. The way he prepared it, the way he communicated with everybody before we started made it so much easier to tell the story. And the fact that he kept communicating and stayed open the whole way, it made it a very efficient shoot - a very enjoyable production to work on.